Friendship is an extraordinary and unique feeling shared between people. A true best friend is hard to come by and it’s important to remind your friends how much they mean to you. 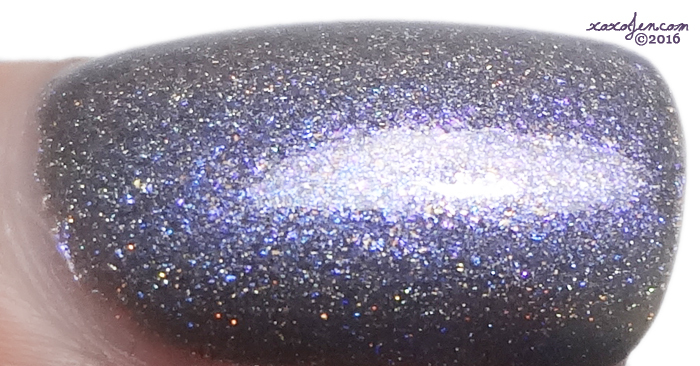 With that, I bring you a polish from Anchor & Heart Lacquer from the My Friends, My Anchors collection, called The Rock. When I first laid eyes on this polish, I knew I had to have it. Smokey purples and holo always catch my eye, I have to have them all. In fact I did a custom collab polish with a similar concept a while back. After receiving The Rock, I was quite excited to wear it - in the bottle it is stunning. On the nail, even more so! I wore two coats with topcoat for over a week. The wear time is fantastic, application perfect, and formula smooth and easy, like butter. This was my very first purchase from Anchor & Heart, and I'm sure I'll be returning to get the next polish of hers that catches my eye. If you've not tried this brand, you should. Taryn is a sweetheart, you can get to know her through her facebook group and other communities there. She is quite active and personable. She is also featured in our upcoming Teal Box over at The Color Box. If you haven't joined us yet you should! Each blogger will begin revealing their polishes in the group starting tomorrow! I love steel shades with lavender tones! Gorgeous! I need some a & h in my life! This is so smokey and beautiful! This is amazing! I bought the full collection. I'm loving that violet shimmer! Wow!